Select Shipyard A. & J. InglisA. B. BullA. G. NeptunA. Leslie & CoA. McMillan & SonA. OmundsenA/B GötaverkenA/B Lindholmens VarvA/S Fredrikstad Mek. VerkstedAG VulcanAG WeserAitken & ManselAkers Mekaniske VerkstedAlexander DennyAlexander Stephen & SonsArdossan Drydock & ShippbuildingArmstrong Whitworth & Co.Armstrong, Mitchell & Co.Backhouse & DixonBarclay, Curle & Co. Ltd.Barrow Shipbuilding Co.Bartram, Haswell & Co.Bergens Mekaniske VærkstedBlackwood & GordonBlohm & VossBonn & MeesBradbænkenBremer VulcanBricks KranBrownlow, Lumsden & Co.Burmeister & WainBurrard Dry Dock Co. Ltd.C. & W. EarleC. A. Day & CoC. Mitchell & Co.C. S. Swan & HunterCaird & Co.Caledon Shipbuilding & Eng. Co.Cammell, Laird & Co. Ltd.Canadian Vickers Ltd.CarstensonCharles Connell & Co.Clyde Shipbuilding Co. Ltd.D. & W. Henderson Ltd.Dekkes verftDeutsche Shiff-und Maschinenf. AGDobie & Co.Dundee Shipbuilding Co.E. A. HagglundE. Withy & SonEarle‘s Shipbuilding & Engineering Co.Edwards Shipbuilding Co.Elija BuggeEriksberg Mekaniska Verkstads A/BF. D. TuckerF. PetersenF. SchichauFairfield Shipbuilding & Eng. Co. Ltd.Fevigs Jernskibs-byggeriFlensburger SchiffbauFramnæs Mekaniske VærkstedFredrikstad Mekaniske VerkstedFrøvigFurness, Withy & Co.G. Howaldt?G. PedersenG. SeebeckGeorge BourneGeorge F. PattenGeorgernes værftGermania WerftGourlay & Co.Govan Shipbuilding Co.Grans værftH. B. Cappelen, GjemsøH. F. UlrichsHall, Russell & Co. Ltd.Harland & WolffHawthorn, Leslie & Co. Ltd.Hayden & CudworthHeggblad HammarstenHenderson, Coulborn & Co.Hill & CoHillevågsværftetHowaldtswerkeHr. J. Grans VerftHumphrey & PearsonHyp. DubordI. TangenIrvines Shipbuilding CompanyJ. & G. Thomson & Co.J. A. Køhler & Co. J. A. Westervelt & SonsJ. B. & J. D. Van DusenJ. C. TecklenborgJ. E. ScottJ. H. Holt (Toldbodbryggen)J. JørgensenJ. L. Thompson & SonsJ. Scott J. SimonsenJ. Trumpy & SønnerJac. MøllerJacob WoxenJalvor J. GrefstadJames Laing & Co.Jens BlockJensen (ombygget)Joh. WessmannJohann LangeJohn Brown & Co. Ltd.John Elder & Co.John KeyJohn LairdJohn Wood & Co.JordfallenJørgensen & KnudsenKaldnes Mekaniske VerkstedKiellandsgrundenKiswickKockums Mekaniska VärkstadsKoninklijke Mij de ScheldeLaird BrosLithgows Ltd.Liverpool Shipbuilding Co.London & Glasgow Co. Ltd.M. Pearse & Co.M. Samuelson & Co.Machinefabreiken Scheepswerf van P. SmitMalcolmson & Co.McLachlan & StackhouseMitchellMoens værftMorbergMounsey & Co.Murray & CoMaatschappij FijenoordN. Odero & Co.N.V. Nederlandsche Dok en Scheepsbouw M.Napier & Miller Ltd.Nederlandsche Stoomboot MijNedre værftNew York Shipbuilding Corp.Nieuwe WaterwegNorrköping Varv och Verkstad A/BNorthumberland Shipbuilding Co.Nylands VærkstedO. & L. DønnesmoenO. P. ÅbergOdders shipyardOdense Staalskibsværft, A.P. MollerOle Pedersen BuerOrlogsværftetOsebakkenPalmer‘s Shipbuilding & Iron Co. Ltd.Patten & StunderantPearse & LockwoodPennsylvania Shipyards Inc.Ploug & SundtPorsgrunns S. B. SelskabR. & J. Evans & CoR. & W. Hawthorn, Leslie Co. LtdR. Clover & Co.R. Hickson & Co.R. Thompson & Sons Ltd.Raylton Dixon & Co.Reforms VærftReidReiherstieg Schiffswerfte & MaschinenfabRichardson, Duck & Co.RickmersRobert Duncan & Co.Robert Napier & SonsRobert Steele & Co.Robert Stephenson & Co. LtdRoosevelt, Joyce & WaterburyRosekildens verftRotterdamsche Droogdok MijRød & Co.S. & H. Morton & Co.S. HansenSam, LaphamSandeman & McLaurinSchiffswerft und Maschinenfabrik AGSchlesinger, Davis & Co.Scott & CoScott‘s Shipbuilding & Eng. Co. LtdShort BrothersSmith & DimonSmith & RodgerSoutheastern Shipbuilding Corp.Stephen G. BogertStettiner Oderwerke AGSun Ship Building Co.Swan, Hunter & Wigham RichardsonT. J. WilborgT. R. Oswald & Co.Thomas Wingate & Co.Thos. C. BartlettThos. Royden & CoTod & McGregorUglands værftUnion Irons WorksV. SandstrømVan Vlissingen & Co.Vaughan & LynnVickers Ltd.Vig VærftVulcan WerkeW. Cramp & SonsW. Gray & CoW. Pile, Hay & Co.W. Simons & Co.Watson & CoWigham, Richardson & Co.Willard HallWilliam Beardmore & Co.William Denny & Co.William Doxford & SonsWilton-FijenoordWm. Hamilton & Co. Ltd.WoodWood Skinner & Co. Ltd.Workman, Clark & Co. Ltd.
Search Trond Austheim's database of passenger ship arrivals around the world, as reported in the newspapers 1870-1894. 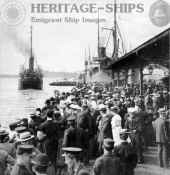 Find information about what transatlantic steamship companies the different Norwegian emigration agents represented, and in what way the agent was authorized to convey the emigrants. This will often let you know details about the routes and ships they used, and narrows your search for the passenger list. Search by words "starting with" or full words. You can only search for agent or line separate. Maritime inscription - registers of seamen - An example on how to use the maritime inscription records. MACHINERY OF ATLANTIC STEAMSHIPS - This article is a collage of edited cutaways from contemporary sources. It focuses on the development of the machinery used in the transatlantic steamships up till about 1910. 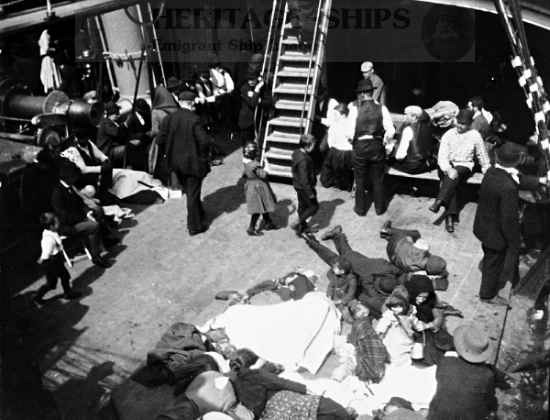 Passenger lists and Ulvestad search combined. A selection of articles dedicated to help you in your genealogy search for your Norwegian ancestors. Transcripts and pictures of historic documents in connection with the ships and emigration. Also including articles about Pioneers & Norwegian Settlements Around the World. Information & advice for emigrants issued by the Allan Line in 1883. The line was then under contract with the Canadian Government for conveyance of Assisted Passengers. Description and pictures of the legendary German passenger liner Kaiser Wilhelm der Grosse - The life and fate of this legendary ship with pictures of life on board. The Transatlantic Crossing on a Scandinavian America Line steamship - In progress now is a web page describing life and conditions aboard the Scandinavian America Line steamships which brought such a great number of Scandinavian emigrants across the Atlantic.